The 1976 Oldsmobile Toronado Custom weighed 3 159 kilos (4,761 pounds) and listed for $8,177 f.o.b. Oshawa. Oldsmobile was long distinguished as General Motors' avant-garde technical division. It could claim many engineering firsts including the distinction of offering the first front-wheel drive automobile in the United States since the 1937 Cord. The seductive coupe bowed for the 1966 season as a full-sized personal luxury vehicle. The sleek and ritzy two-door Olds shared components with the rear-wheel drive Buick Riviera. Both were intended to compete with Ford’s Thunderbird. Finding a name for the car took careful consideration. Raven, Magnum and Scirocco were all considered before settling on Toronado. The name didn’t mean anything but it did have a bit of history; it had appeared on a 1963 Chevrolet concept car. North's styling study was of no consequence to anyone but it was suddenly chosen when Oldsmobile staff was informed that it would be allowed to build a car to compete against the Ford Thunderbird for the 1966 model year. Top brass wanted the vehicle a full-sized model platform. The design team wanted a smaller car. Despite the team’s best efforts to have the posh Olds built on a smaller wheelbase, top brass was adamant that it debut on a full-size wheelbase. Oldsmobile's engineers had been working on developing practical front-wheel drive since 1958. The concept was popular in Europe and it was well known that both Ford and Rambler were working on front-wheel drive projects. Ford was rumoured to be readying the 1961 Thunderbird for front-wheel drive and Rambler was said to be introducing the technology on its 1963 or 1964 models. Toronado sales were added together to those of the stately Oldsmobile 98. For the 1966 calendar year, 2,198 units were delivered across the Dominion. The car earned Motor Trend magazine’s Car of the Year Award. 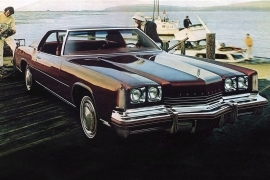 In 1967, Toronado sales were broken out from those of the Oldsmobile 98. Records show that 580 of the front-wheel drive beauties were delivered throughout the Dominion. The restyled Olds Toronado that bowed for 1971 was more elegant than previously. 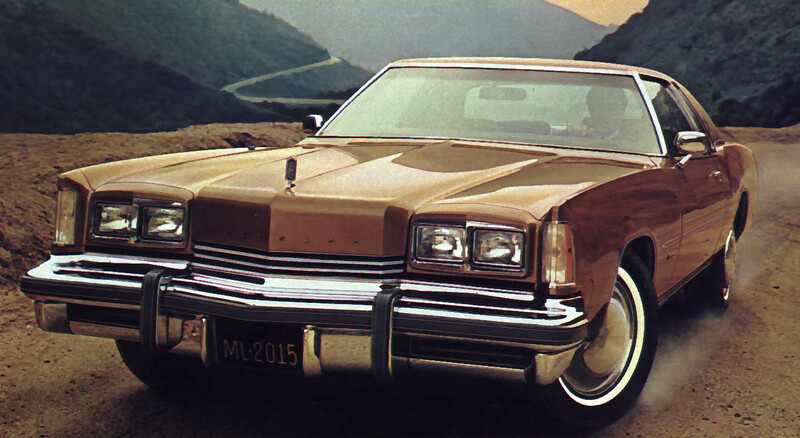 A second generation of Toronados arrived for the 1971 selling season. They were among the first cars to use the high-mount third brake light in the rear centre of a vehicle.The 1974 to 1976 models offered driver’s-side airbags. Times and consumer tastes were changing. Oldsmobile needed to redefine itself in a shifting marketplace. Toronado measured 3 098 millimetres ( 122 inches) on the 1976 model. The 1976 Toronado was more angular than before. The landau roof came in seven different colour choices. Its face was almost austere and casket-like in appearance. The grille consisted of two very simple, slightly Vee’d horizontal bars and an elongated hood, topped by a standup hood ornament. Rear styling treatment was also angular with thin slits of taillamps at bumper level and massive fender end caps colour-keyed to the body. was seen quite often by drivers of lesser automobiles. The Toronado’s base engine was the 7.5-litre (455-cubic inch) Rocket V-8 with a four-barrel carburetor and a high-energy ignition. Also standard was the GM Turbo Hydramatic transmission. Upholstery was a geometric nylon knit weave velour or for a few dollars more, a supple vinyl. Seating boasted centre armrests. The instrument panel was expansive with controls to the left and right of the driver. The clock featured digital quartz movement. Toronado's instrument was vast, designed around a strip speedometer. There were a dozen colours for the exterior of a Toronado. Black, Cream, Buckskin, Yellow, Red and White for starters. Metallic colours were popular and in that family one could choose Silver, Light Blue, Dark Blue, Red, Mahogany, Saddle, Dark Green and Lime. Options for Toronado included an appearance package, an illumination package, Four Season air conditioning, cruise control, tinged glass, six-way power seats power trunk release, power windows, power door locks, a tilt-telescope steering wheel, numerous radios with or without tape player and many other goodies. Cutaway of the 1976 Oldsmobile Toronado showcases GM’s front-wheel drive layout. 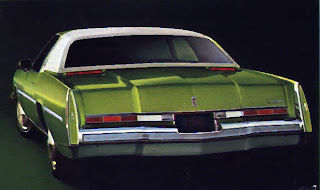 Sales of Toronado were lumped in with Oldsmobile 98 for the 1976 calendar year. The total for the luxurious pair added up to 4,362 deliveries. That figure was down dramatically from the 5,566 delivered in 1975. There was no need for despair in Oshawa, however. Sales for the 98 and the Toronado would rebound nicely to 7,045 units sold in 1977.